Home » ACME Screening Room » NO SHARING! Really. Posted by Sara Scully on Jun 11, 2013 in ACME Screening Room, Lambertville-New Hope, Local-Sustainable Living | Comments Off on NO SHARING! Really. When I was in high school I worked in the mall at Souper Salad. One of our jobs was to bust people who tried to share their order for the all-you-can-eat salad bar. Our media-technology marketplace has effectively become one big no-sharing-salad-bar. We no longer share a phone in our home. We each have one. I think its been a decade since I have said the phrase, “Hi, is Jim there?” or “Could you please leave him a message?” You either reach Jim or you don’t. Its certain and requires no social skills or encountering potential strangers, annoying roommates, or prying parents in the process. And you don’t have to rely on others to help you, only a machine. I recently learned that even if I have my very own cell phone, if I get an iPad, I have to get another one for that, to use it like a phone. What? What? What! Another stingy money-grab for these cellular companies. You used to make share-able mix tapes. Ok, I wont go there. You’ve heard it before and still you love your iTunes downloads that are only allowed on just a few of your machines. 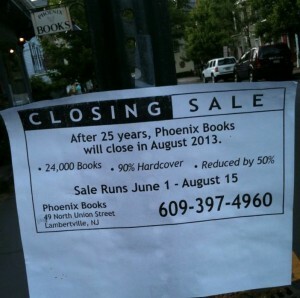 A local sign of the end of sharing, is the closing of our beloved bookstore, Phoenix Books, Lambertville, NJ. This is just years after our video store closed in 2009 (see my 2009 Letter to the Editor on this pasted below). Phoenix was dusty and kind of a rabbit warren of treasures, but also a place that required all kinds of sharing: of space, books, and conversation with strangers or staff. To shop you had to negotiate the space with other people, passing through its rabbit warren of shelves, maybe ignore weirdos around a corner, or lovers paging through books together, in the back. The space made you see books you never dreamed of reading, and witness what others were pulling off the shelves. Shared inspiration. I never shopped there without finding something new. And all the used merchandize had been shared once. The pages were a bit worn, evidence of others. After buying a book, you could pass it on, or put it on your coffee table for guests to find and peruse, or look at it on a shelf as an intellectual touchstone of where you once were. You cannot do this with an e-reader. Hypocritically, some of these folks with e-readers, or who shop online brazenly have been attempting to “share” the content of surviving local bookshops, WITH THEMSELVES ONLY! 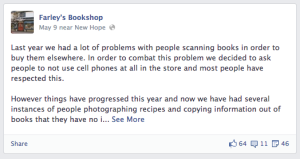 New Hope, PA’s Farley’s books recently reported on Facebook that some of their customers were scanning books so they could look them up for a lower price online, or even taking cellphone snapshots of content, like recipes to avoid buying the book! Our once shared experience of movies and music is now mostly solo, with digital downloads, and online delivery. We watch alone at home or on a personal phone. We listen to music on an iPod with headphones in public, even when surrounded by friends. Simultaneously, many of the places to listen to live music with others have closed in the greater New Jersey area: The Court Tavern, City Gardens, and now Maxwell’s. And, in Hunterdon County all of the movie theaters are gone, except the ACME Screening Room. I run the ACME Screening Room and we are now the only theater in Hunterdon County. We recently showed a film about Krishna Das, ONE TRACK HEART, who made his career, and found spiritual awakening through sharing, i.e. group chanting or kirtan. Before the film, half the audience in the dark room had their heads tipped down looking at their phones. Seeing them this way, I realized, ACME is preserving sharing. These folks may doggedly ignore those around them before the film, staring at their phones (or reading what the people they “like” are doing online). But once the movie starts, they have to watch and react together. 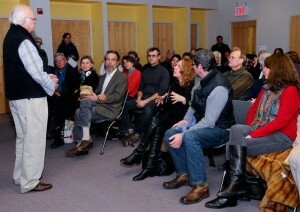 Afterward, during our post-film discussions, they have to speak with each other. This is powerful. Why? Because there is no filter, and its totally unpredictable. It challenges one to encounter others, to hear ideas you might not “like.” or even people, like the ones who talk a lot and don’t listen. To fully participate you have to find a way to let go of judgement, and be open. And that’s spiritual. 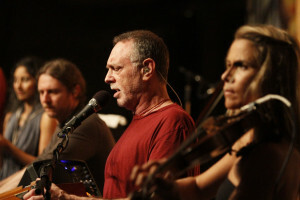 Krishna Das’ karmic journey reminded me a lot of the community media sharing dynamic. Throughout his life, Das kept coming up against hurdles like depression and dissatisfaction that were created by his own desires. He did not overcome these hurdles until he recognized his entire career was based on feeding his “likes”: desire for fame, adulation, certainty. Ironically the turning point for him was participating in a giant sharing ritual in India, his gurus “big form,” as well as doing some serious prayer. Das finally opened up to the idea that he would be forever dissatisfied playing kirtan if it was always about enjoyment, like or dislike, making himself happy or avoiding being sad. His playing became a practice instead, which he would do, regardless of how he was feeling. Playing meant entering into a realm of selfless sharing with others. And that, ironically brought Das complete fulfillment. He was no longer hungry, on a constant quest to feed his desires. We believe we share online but its all based on what or who we “like.” The machines we use are programmed to feed our preferences, and satisfy desire. In a face-to-face discussion with strangers after a film, the only way it works and moves ahead is with Krishna Das-like openness, to let go of self-pleasing preference, and embrace the practice of discussion. Now, there are also times one might love what she is hearing too, and that’s just a perk, to have a mirror and know, “Wow, there are dozens of other people out there who also care about this issue.” That’s kind of nice, but not particularly intellectually eye-opening. Its far more comfortable to sit on your couch alone, or with one other person you like, and see what the system has selected for you. The media-machine (computer, home tv or phone) never asks us to get past the dichotomy of like or dislike into the realm of critical engagement with a constellation of ideas, to engage in a practice of seeing to the total extent we are capable. On a college mid-term review a professor once wrote me a line that influenced my thinking this way, “Do not dismiss what you do not like.” He was encouraging critical thought. But in this contemporary world of solo media consumption, shuttered bookshops, and music halls, my professor’s direction is a precious pursuit of the past, a relic of a time when to “like” was a feeling, and not a daily action that builds our entire media context. Bummed out now? Well, then, consider getting beyond the like, and open up to an out of the ordinary film at the single local theater that remains in Hunterdon County, ACME Screening Room! Hope to see you there. Just before I sat down to write this letter of recognition for the generous support Friends of Lambertville Library received for our ACME Screening Room’s showing of Food, Inc. September 18-20, I received news that further underscored how vital our local businesses/organizations are to the health and diversity of Lambertville, specifically that Lambertville Video Store is closing. So, I’d like to take a moment to recognize the store, because without them there would be no ACME Screening Room, now over a year in its making, to present Food, Inc. with generous sponsorship from other wonderful community groups, namely: Hunterdon Land Trust Alliance, Rojo Roastery, Big Bear Natural Foods, Flip Dog Yoga, Bucks County Foodshed Alliance and New Hope Farmers Market. On behalf of the Friends, I thank those groups for enabling us to bring Food, Inc to Lambertville, for your vision in support of local food and a Lambertville more aware of the far away place most of its food is coming from and for your support of local indie cinema in Lambertville. And on that note, I want to take a moment to recognize where the ACME’s films have been coming from, locally, which will be no more, Lambertville Video. Lambertville Video Store has been beloved for many reasons. For me personally, the store has been a treasure trove of indie films, titles I would often discover in surprise, thinking “Wow, they have that!” and simultaneously feel proud that my little river town, miles from New York City had a video store with a collection of such quality, all within walking distance. Lambertville Video has also been a store with character, with staff as diverse as its film catalogue, people with attitude and opinions, who care about film and know about film. How often do we enter a store these days and ask the staff about a product and they have no idea how to answer, they “just work there”? This has not been the case at Lambertville Video Store. You might not like the opinion, but you’d get one. The Video Store was also a place to see your neighbors, literally on line or figuratively, by scanning the various flyers taped to the wall for local events. In short, going into this store meant renting a video, but it also meant getting to know your community. And for the Friends’ ACME Screening Room, Lambertville Video was a partner in growing our weekend program. At least once a month, sometimes every weekend, Lambertville Video Store rented, for free, the film for our weekend film screening. This not only enabled us to pick up the film within walking distance, no driving to the mall or a chain store, it saved us the program rental costs which was a great help to our surviving the past year, financially. What’s more, this decision to partner with us was made by the store owner Jane and manager, Josh, not a corporate office — instead, a local business run by locals who could make decisions based on what was important to the community, without contacting “corporate” a thousand miles away to make the decision for them based on insurance issues and marketing targets. We will mourn losing this local resource, not simply because it impacts where we get our ACME films but moreover because it is a harbinger, like the local farm story in Food, Inc. of the consolidation of small local businesses into economies of scale. Whether it be agribusiness like Monsanto pricing out small farmers with low cost, high volume, government subsidized, genetically engineered foods or media conglomerates like Netflix and on demand services replacing local video stores, increasingly the stuff of life, food, entertainment, water, is coming from far away, created and shipped by someone disinterested in our community, presenting “low cost” at a high price, to our community and environment. So we thank and celebrate our local community groups for investing locally to grow a sustainable Lambertville, one with vital local resources: from Lambertville Video Store to Hunterdon Land Trust Alliance, Rojo Roastery, Big Bear Natural Foods, Flip Dog Yoga, Bucks County Foodshed Alliance and New Hope Farmers Market to Lambertville Free Public Library (check out the film catalogue!). And we say a sad, “So long” to Lambertville Video Store. But on their way out, I encourage you reader, to stop in the Video store and purchase a video–they are having a big sale–and tell them how much you have valued the store all these years. We are all in this Lambertville together!